Oh, Pluto. You’re one of our most intriguing and mysterious planets dwarf planets. You were found by accident, because you happened to be in the right place at the right time. None of the inner planets or Ceres have more than two moons, but you have five! The largest, Charon, is about half your diameter but only ten percent of your mass. The other four moons, Nix, Hydra, P4, and P5 (the last two will be getting new names soon) are much smaller, perhaps as small as tens of kilometers across. These small moons, all found in the past decade by the Hubble Space Telescope, are intriguingly near a 1:3:4:5:6 resonance, meaning the innermost moon (Charon) orbits 3 times for every orbit of P5, 4 times for every orbit of Nix, and so on. The orbits of small bodies (which would form these moons) are often destabilized near resonances. We observe this in the inner solar system by detecting gaps in the asteroid belt caused by resonances with Jupiter. 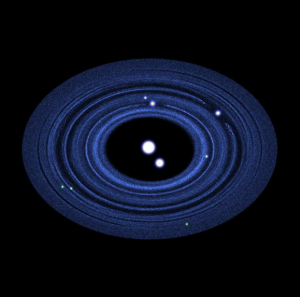 The existence of this near-resonant configuration tells us these moons likely formed somewhere other than their present locations, and then migrated into resonance. Pluto and its moons will receive very close study over the next few years as the New Horizons probe approaches the planet in 2015. This mission will provide fantastic information about the properties of Pluto’s companions, as well as the existence (or nonexistence) of other companions, which will inform theories of moon formation. The authors of this paper, studying possible formation scenarios of these planets, create numerical simulations to study how these moons might have formed and what New Horizons might uncover. Pluto with its five moons. Image taken with WFC3, the new wide field camera on the Hubble Space Telescope. Current theories suggest that Pluto may have been formed in a giant impact, similar to our own moon. The authors begin by questioning if Charon could be produced by a giant impact between a proto-Pluto and another similar-sized object. The outer solar system, while home to an entire Kuiper belt of objects, is a pretty big space; perhaps the density of objects is so low that we wouldn’t expect two massive objects to collide over the age of the solar system. To determine the rate of impacts, the authors simulate a protoplanetary disk of planetesimals (small, rocky planet “seeds”) in circular orbits. The authors populate the disk such that the density of objects is similar to disks around other stars observed by ALMA. They find that collisions between bodies with sizes comparable to Pluto should happen once every 100-300 million years. Since the solar system is about 5 billion years old, Charon and Pluto could plausibly have been formed in a giant impact! After verifying that a giant impact could occur to create the Pluto/Charon system, Kenyon and Bromley propose two mechanisms to form the additional moons. In one scenario, they suggest that material ejected from the impactor and Pluto collected into a ring around the system. Due to interactions between particles in the ring, this ring spreads out into a disk. This is not the only way to form a disk: the disk could have also been formed by Pluto’s gravity attracting other Kuiper nearby Kuiper belt objects which then became gravitationally bound to Pluto and Charon. Regardless, once a disk forms, collisions between the small disk objects causes some of them to gain mass, in a process approximated here. As the larger bodies pass through clouds of smaller objects, they are slowed down by interactions with these small bodies, a process known as dynamical friction. As the large bodies slow down, the gravitational force between Pluto and these bodies begins to dominate over the centrifugal acceleration, pulling the planet into a lower orbit. This process, called migration, is an efficient mechanism to push moons (or planets) into resonant configurations like what is seen in the Pluto system; a similar model has been used to explain the Jovian moons and many of Kepler’s near-resonant exoplanetary systems. Fig. 13 from Kenyon and Bromley. 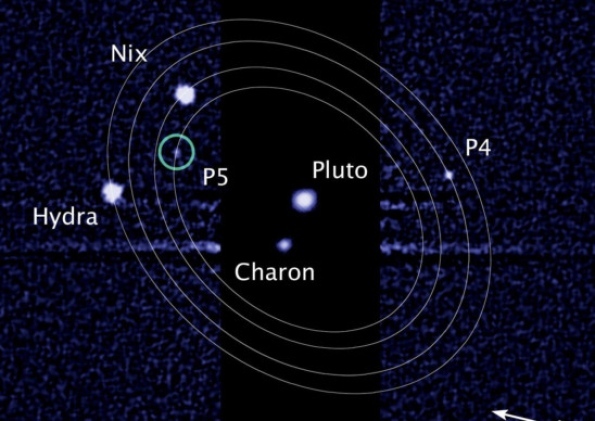 One model of the Plutonian system New Horizons may see in 2015. The white objects are Pluto and its known moons. The three green dots, located beyond the known moons are moons predicted by the authors. The blue represents a tenuous, extended disk. The undetected moons and disk are too faint to be observed from Earth, but New Horizons should easily detect them if they exist. Kenyon and Bromley numerically model the Plutonian system to test this model of moon formation. Through these tests, the authors can place constraints on some of the properties of the moons. In principle, we can determine the masses of moons from Earth by watching the effects of gravitational interactions between the moons, similar to observing the astrometric “wobble” of binary stars or exoplanet hosts. However, since this effect has not been observed on the Pluto-Charon system, only upper limits can be placed on the moon masses (corresponding to the smallest masses at which such signals are detectable). 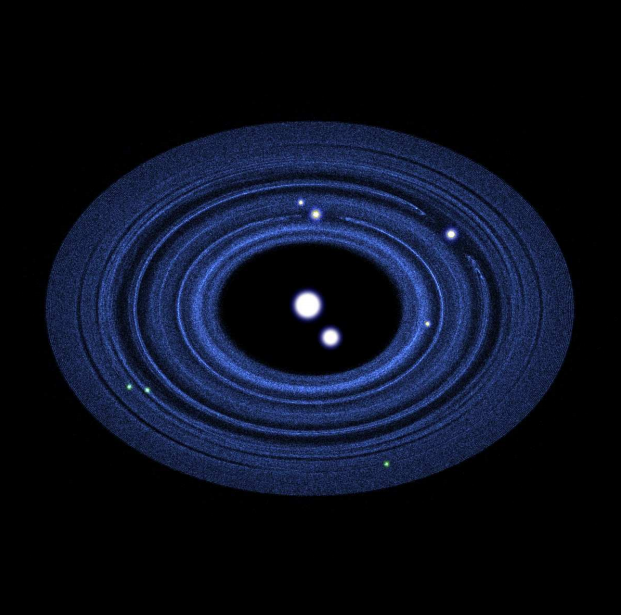 This allows the authors to make testable predictions: for four moons to form, the objects must form in a low-mass disk, so the individual moons probably are not very massive. If the initial disk is too massive, the authors produce fewer than four moons. Since the moons are low mass, their brightness must then be a result of the moons having large albedos (reflectivity), so that they reflect enough light to be detected by Hubble. While currently unknown, this will be testable by New Horizons. In their simulations, the authors also find that objects do not form inside of the innermost small moon, P5. However, in all simulations, they form multiple small moons beyond the orbit of the outermost moon, Hydra. These objects would all be too faint to observe with Hubble, but would be found easily by New Horizons. The figure to the left shows possible orbits for these moons from one formation simulation. The authors also make predictions of observations that could be used to determine if the moons were formed out of material ejected from the Pluto-Charon impact or from a disk captured by Pluto before the impact. If the objects are formed from material from a giant impact, they should all be made of the same materials in the same quantities. Moreover, if the objects were formed by the impact, they might be more oddly shaped than satellites created by accreted material (which would likely form nearly round moons). Finally, the authors predict the existence of a disk of material around Pluto. The size of this disk depends strongly on how the moons formed: disks from the accretion scenarios extend to ~1000 times Pluto’s radius, while disk from the impact scenario extend only to ~100 times Pluto’s radius. New Horizons should be able to test all of these predictions when it reaches Pluto in two years, providing precious data on some of the least-poorly studied solar system objects and allowing the investigation of planet formation in an environment that has been unaffected by the presence of disturbing large planets for 5 billion years.